Update: Asad Umar has categorically denied the claims of the Business Recorder that legalization of cryptocurrencies might be in order and said that the update is not true. 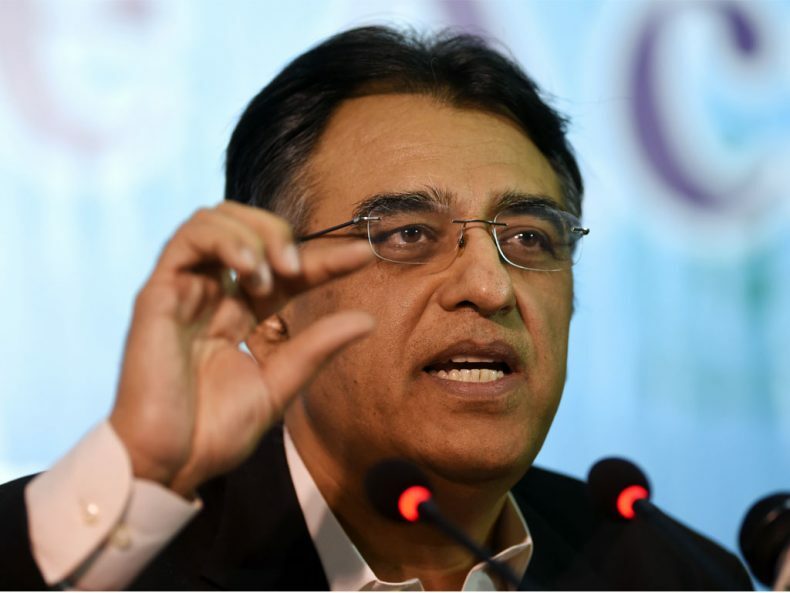 Finance Minister Asad Umar has been given an all-clear sign by Pakistan’s premier intelligence agency to legalize Bitcoin Trade across the country, as reported by Business Recorder. The agency has suggested the ministry to register 5,000 cryptocurrency exchanges and dealers and asked the government to classify those currencies as an “investment” with tax subjected to all the profit gained. The Finance Ministry is also advised to establish a national task force to monitor the flow of transactions through cryptocurrencies and bring the crypto business inside the formal tax regime. The intelligence agency has also shared details about the policy, regulatory and enforcement plan with Finance Minister. These guidelines will help the ministry to effectively deal with the fast emerging trend of cryptocurrency (Bitcoin) trade in Pakistan, which is becoming an active hub for tax evasion. The recommendations provide assistance and countermeasures to the finance minister for phase-wise implementation in June 2019 and December 2019. The intelligence agency stated that “Irrespective of the option GOP adopts, i.e. declaring cryptocurrencies as legal or illegal, a robust oversight mechanism (mapping, investigation, and prosecution) will have to be put in place as soon as possible”. They also added that there are more than 5,000 dealers/exchanges currently involved in this illegal trade of cash/online payment system, in roughly 100 cities of the country and it is increasing with a growth rate of 400% per year. This rapid increase in this illegal activity demands that the stakeholders must take quick and serious action against this situation. The letter from the intelligence agency appraises the efforts made by the finance minister Asad Umar towards the revival of economy and the steps he took in countering the situation. The intelligence agency mentioned how the fast emerging trend of cryptocurrency (Bitcoin) trade in Pakistan is providing an easy/anonymous platform for the tax evasion, money laundering (ML), TF and funding for other criminal activates. This poses serious implications for the GOP and can be a cause of embarrassment at the international level, especially in the absence of robust/comprehensive oversight mechanism to map/monitor the illegal business. 1. Declaration of Crypto-currencies as legal: All such currencies have definite future prospects and are likely to cap the overall financial market in the near future. Pakistan also needs to capitalize on such business opportunities to her advantage like other modern countries instead of declaring these as illegal. The responsibility may be given to MOF/SBP and timeline should be June 2019. 2. Registration of Crypto-currency exchanges and individuals: In order to monitor/ bring under the tax net, the cryptocurrency/Bitcoin exchanges and individuals involved in trade need to be registered under Pakistan Stock Exchange(PSX) and Securities and Exchange Commission of Pakistan (SECP) for mapping/clear visibility purposes and to increase taxation. The responsibility may be given to MOF/SBP/SECP/PSX and timeline should be June 2019. 3. Classification of Cryptocurrencies: There is a need for new classifications of crypto-currencies as “an investment” with all net gains to be taxed. For example, the US tax authority (IRS) has classified crypto-currencies as “property” for the purpose of federal taxation, whereas the US Treasury Department’s FinCEN (Financial Crimes Enforcement Networks) has classified crypto-currencies as “value” for the purpose of AML/CFT obligations. Other countries have taken a different approach, avoiding a formal classification and focusing instead on the nature or type of transactions being conducted. The responsibility may be given to MoF/SBP/FBR and timeline should be June 2019. 4. Develop a coordinated virtual currency strategy: It should include outcome goals, a description of how the GOP intends to achieve these goals, and an action plan with a timeline for implementation. In addition, the strategy should be to use the tools available to FBR and identify how the FBR is going to meet its Bank Secrecy Act (BSA), criminal investigation and tax enforcement obligations as related to virtual currencies as well as identify how actions will be monitored and the methodologies used to measure the actions taken. The responsibility may be given to PTA/MoF/SBP/FBR and timeline should be June 2019. 5. FATF report and guidance: All concerned are also required to carry out the study of FATF reports including ‘Virtual Currencies Key Definitions & Potential AML/CFT Risks-June 2014’ and ‘Guidance for a Risk-Based Approach-Virtual Currencies June 2015.’ All countries are required to implement the relevant AML/CFT requirements specified by the FATF as international standards to convertible virtual currencies (VC) exchanges. This should include three areas like knowing your customer procedures, maintaining certain transactional records and reporting suspicious transactions of various types. The responsibility may be given to all departments and the timeline should be June 2019. A): Analysis of models adopted by different countries and promulgation of relevant laws. B): Training to acquire technical expertise to oversee/track such trade i.e. through exchanges and well as individual-based trading. C): Establishment of a special department within the SBP to study the impact of trade and deal with such currencies as housing finance experts, cyber experts, data analysis and representatives of intelligence agencies. D): Nomination of a lead agency/department to carry out a related investigation. The recommended department is FIA. E): Stringent KYC and scrutiny of transactions by financial institutions (FIs). F): It is suggested that GOP establish a national task force on the module of Australia and the USA comprising members from all concerned departments to monitor the flow of transactions through crypto-currencies. G): Examples of establishment of a monitoring department of virtual/cryptocurrencies by contemporaries: In December 2017, Australia passed an amendment to AML/CFT legislation to cover digital currency exchanges which are being monitored by AUSTRAC under the amended legislation i.e. Digital Currency Exchange Providers Law under which they are required to register in AUSTRAC’s new digital currency exchange register. In the USA, a Bill titled ‘Financial Technology Innovation & Defence Act’ aims to form a new task force headed by the secretary of the treasury, with other members (attorney general & directors from LEAs including FBI, CIA & secret service) who can propose regulations to counter such activities. South Korea has banned anonymous trading of crypto-currencies and introduced the real-name system which went into the effect immediately. Investigation: Until the government collectively enforces the regulatory principles, the responsibility will fall on the law enforcement and bank AML units to identify suspicious transactional behavior at the points of ingress and egress between the financial institutions and basic crypto exchanges. For banks, this approach should be two-fold i.e. investigator training and crypto-exchange focused detection scenarios. Many legitimate investors regularly transact between banks account and basic exchanges. As with any AML operation, segmenting normal customers from possible money launderers requires specific considerations. The GOP also needs to adopt this model. The responsibility may be given to MoF, SBP, FIA, FMU, and PTA with a timeline of December 2019. Human Resource (HR) Training: It is of utmost importance that requires capacity building of HR/LEA/representatives of intelligence agencies dealing with the subject be done through technical training in order to effectively play their role. The responsibility may be given to MoF and SBP with a timeline of June 2019. Creation of Framework for Initial Coin Offering (ICOs): ICOs are the basic tool for Bitcoin users to go through its future process. It is a new business model for the exchanges/companies offering new coins. If an exchange wants to offer ICOs, the regulation should require them to ensure that the ICO meets certain criteria. A clear set of rules on what is and isn’t acceptable should be set out.